Home People The Leaning Tower of Pisa! And The Leaning People of Pisa? 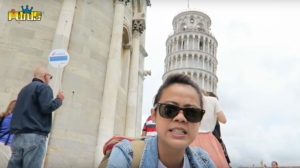 In this edition of “The Wanderlist”, Ivy visits the unique “Leaning Tower of Pisa” known for it’s unintended tilt. First of all the tower’s tilt began during construction in the 12th century. Because the foundation on the ground was too soft on one side to properly support the weight of the tower. Therefore the tilt continued to increase until the structure was stabilized in the late 20th and early 21st centuries. Even with its reputation, interestingly enough it’s not the world most lopsided building. The Leaning Tower of Suurhusen has challenged its title. But instead it is the 2010 built Capital Gate in Abu Dhabi that has most recently claimed the title of “World’s Furthest Leaning Man-made Tower”. 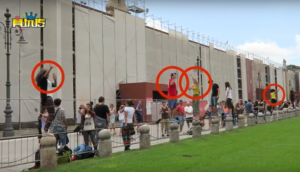 The Leaning People of Pisa? As famous as the Leaning Tower are the people who pose for the classic tourist shot holding up the iconic tower. As a result Ivy lovingly names this abstract attraction the “The Leaning People of Pisa”. Previous articleMing Kee Chicken Rice: Steamed Chicken is Best Served… COLD? Next articleGrandma’s Tang Hoon Egg Soup!